Henley boys had a good Junior Sculling Regatta and outstanding Walllingford Regatta 5th and 6th May 2018, winning both J16 4x by 10 seconds and Schools 4x-, beating Leander’s A crew by a few feet. The resurgent boys’ squad had a very successful weekend of competition, culminating in two great wins at Wallingford Regatta. 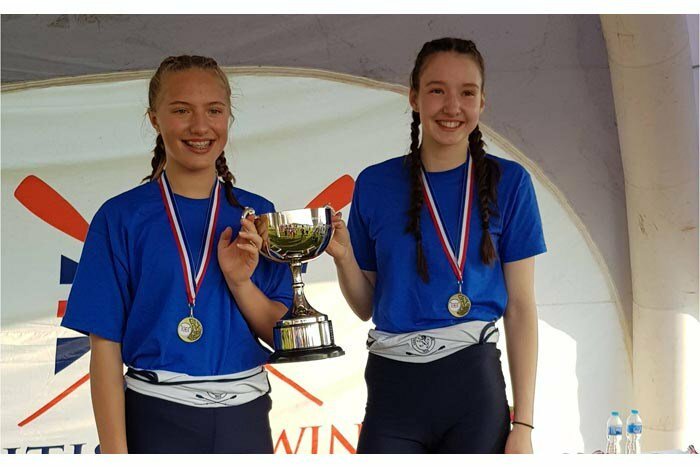 On Saturday at the Junior Sculling Regatta, held in near perfect weather at Dorney Lake, Henley came away with a fine medal tally of a gold, two silvers and two bronzes spread across a wide range of boat classes. The gold came in J17 1x where Balthasar Issa led out of the blocks to win by 8 seconds not allowing his opponents including scullers from Leander and Marlow any opportunity to get on terms. In J18 2x Ethan O’Connor and Lewis Howlett raised their game from their time trial to scull strongly and efficiently into silver medal position behind a strong Windsor Boys crew. In J16 2x James Swinburn and Euan Turnell took silver behind Lea ,but well clear of the chasing pack. The bronze medals came in J18 1x through Bruce Turnell and Ed Roy in J16 1x. 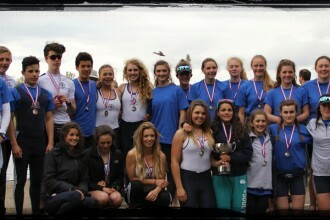 At Wallingford Regatta on Sunday, both Henley’s crews won gold. First off the J16 4x – produced a truly commanding performance to lead through 500 and then unleashed an awesome display of powerful sculling through to 1k which left the rest of the strong field far back in their wake. The crew of James Swinburn, Seth O’Connor, Ed Roy and Euan Turnell finished a remarkable 10 seconds clear of their nearest rivals Sir William Borlase, who in turn led Claires Court School, the latter winners at the Junior Sculling Head in March. Another outstanding performance came in Open School 4x- for J18s. The crew of Ethan O’Connor, Bruce Turnell, Balthasar Issa, and Lewis Howlett faced strong opposition in their final from Leander’s A and B crews, Lea, Marlow, Emanuel and a crew from the South African Schools Rowing Association. In the event in the closing stages it turned into a gripping two boat race between Henley and Leander A. Henley had led at 1k, but Leander put in a strong 3rd 500 to lead with 500 to go. With 200 metres left Henley were half a length down, but put together a remarkable sprint at 42 stokes per minute to take Leander by 0.25 of a second. On Saturday, the WJ 14 quads of Natalie Schoenmakers, Laoise O’Donohue, Mia Roullier, Ella McKay, cox Daisy Rolstone and Charlotte Beadsmoore, Josie Sawbridge, Beatrice Bethell, Cleo Davis and cox Guy Ellis, dominated their event winning the time trial comfortably in first and second and then going on to take Gold and Silver in the A final. A second Gold medal in an “A” final came from Holly Cookson in WJ15 single sculls winning her time trial by 9 secs over St Edwards School and then going on to take an early lead in the final which she continued to extend to take an easily victory. In WJ15 quads Georgie Pollard, Izzy Cotten, Darcey Smith, Holly Thompson and cox Maddison Sturgess pulled back from a third place in the time trial to take second place and a silver medal in the “A” final. Poppy Wilson, Holly Nave, Della Luke, Ava Reineke and cox Chloe Beeton, under cooked the time trial and finished in 10 place but pulled it back in the “B” final with a good race which saw then leading to the last few hundred metres when they where pipped by Latimer Upper who due to the cross wind where in the favoured lane 1. 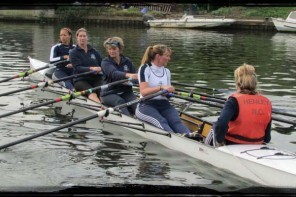 This still gave the girls the silver medal for second crews. 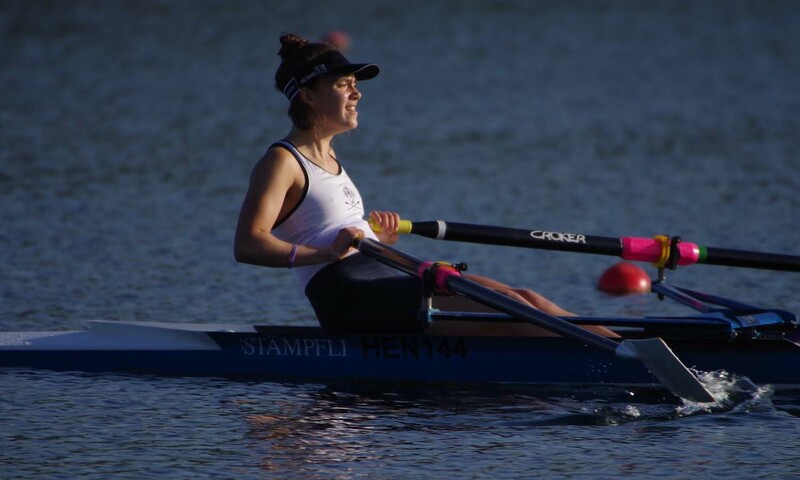 Both girls J15 double sculls, Annabelle Hoogenberg with Riley Butcher and Emilia Fulford Dobson with Gina Segrt made the “A” final, with Emilia and Gina guaranteed a Gold medal even before the final started being the only club second boat to make the A final. Sunday saw most of the girls and boys return to Dorney for Wallingford Regatta the big first regatta for both Seniors and Juniors, the regatta is split into two divisions morning and afternoon so crews can compete in two events. It is also a winner takes all regatta with no second or third place medals but the winners being presented with traditional “pots”. In the afternoon the girls under 15 eight of Poppy Wilson, Gina Segrt, Holly Thompson, Darcey Smith, Della Luke, Izzy Cotten, Georgie Pollard, Holly Cookson and cox Maddison Sturgess also had a straight final. This was another convincing and dominating win. Leading with 500m gone the girls put the foot down going into the halfway mark to extend there lead to clear water and continued to extend this to a four length victory over Marlow in second . With a little bit more work to do the girls under 18 coxed four of Maddie Pollard, Daisy Butterworth, Grace Johnson, Phoebe Fletcher and cox Ella Nolson had an 8 sec win in their semi final to qualify them for the final, in which they led from the start and just continued to extend that lead to take the win finishing 12 seconds ahead of the girls from Marlow RC. 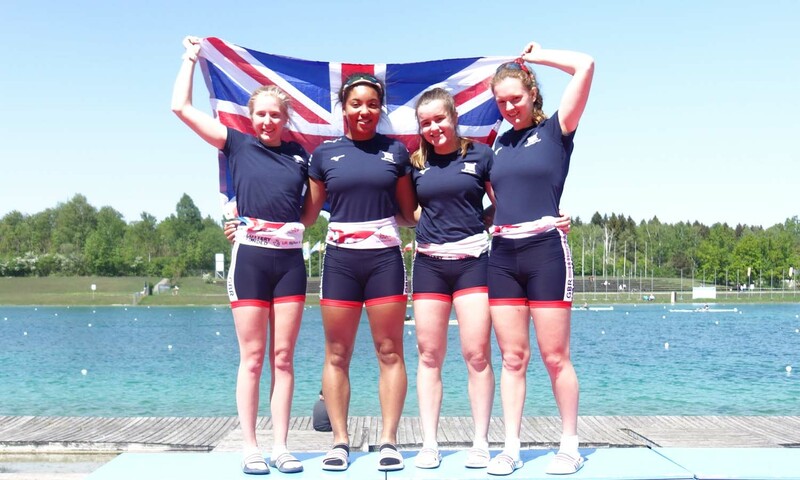 In Munich Issy Jonsson, Mary Wright, Lottie Orr and Georgie Robinson Ranger where racing for Great Britain at Munich Regatta. On Saturday Lottie and Georgie raced in the double sculls winning their heat but finished fourth in the final with a difficult cross wind playing havoc with the lane draw. 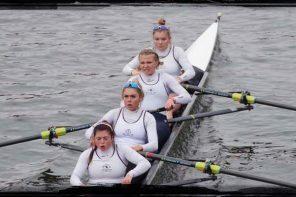 On Sunday the girls joined up with Rhiannon Morgan Gloucester RC, and Natasha Strudwick Marlow RC, in the quad where they finished third in their heat with the first two progressing to the final. 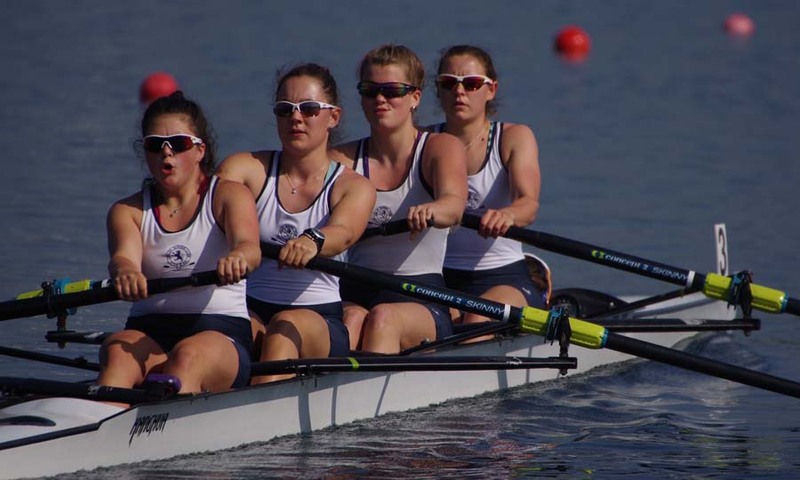 Mary Wright and Issy Jonsson competed in the coxless four on Saturday with Celia Mathews from LEH and Olivia Caesar from Monkton Coombe School, second in their heat the girls went on to finish fifth in the final. In Sundays racing the girls had a better performance and recorded the fastest time a cross the two heats to take the gold medal. The boat was then split into pairs and Issy and Mary recorded the fourth fastest time across the two heats.